Good morning. It is a pleasure to be here for the opening of the Asian Logistics and Maritime Conference 2017. This is the Conference's seventh edition. It is also the third year in a row I have had this welcome opportunity to address you here, and of course this time, for the first time as the Chief Executive of the Hong Kong Special Administrative Region. I am glad that the Conference has grown in scale over time, and now it has become the biggest of its kind in Asia. The Conference this year is particularly special as it is one of the celebration events of the 20th anniversary of the establishment of the Hong Kong Special Administrative Region. We are honoured that Minister Arkhom from Thailand is this year's keynote speaker. His presence here signifies a new era of closer ties between Hong Kong and Thailand, ushered in through the signing of the Hong Kong-ASEAN Free Trade Agreement earlier this month and the recent announcement in my maiden Policy Address that Hong Kong will set up a new Economic and Trade Office in Thailand. Indeed, since taking office, I have met Prime Minister Prayut twice, during my official trip to Bangkok in August and at the APEC meeting held in Da Nang, Vietnam earlier this month. As we celebrate the 20th anniversary of the establishment of the Hong Kong Special Administrative Region, we reflect on our past achievements under "one country, two systems" and aim to map out a new vision for Hong Kong. 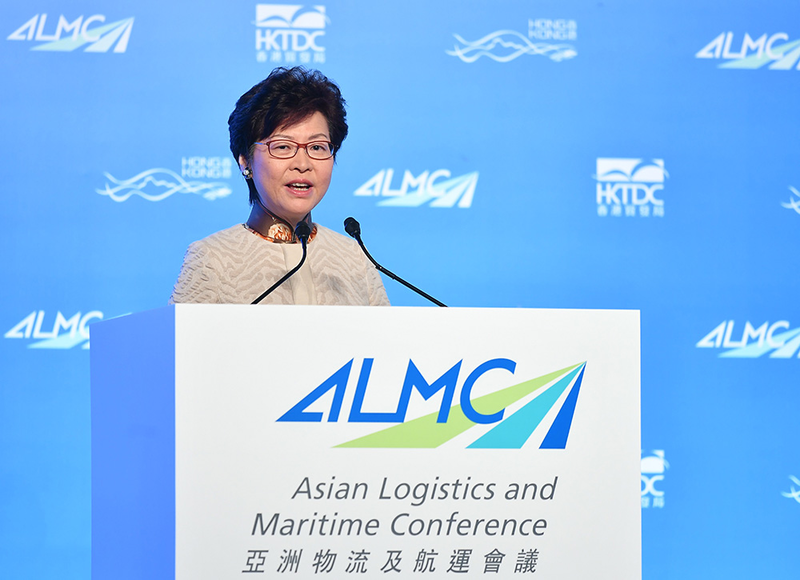 Speaking of achievements, the trading and logistics industry is one of the four top pillar industries of Hong Kong, contributing about 22 per cent of our gross domestic product and 20 per cent of our employment. These did not happen by coincidence, but for the reason that Hong Kong values and embraces free trade. This conviction has helped nurture our trading industry over the years. Logistics, being the sector that underpins trading, has also benefitted and grown. And it is logistics - the power of linking economies and industries, people, products and services - that will help us realise the connections we need to function and flourish in this era of connectivity. We have what it takes to do well in the logistics sector. Strategically located at the heart of Asia, Hong Kong is connected to the world and Mainland China by a world-class international airport, a container terminal renowned for its efficiency, and extensive land crossings. With our well-developed multi-modal transport network, the logistics industry is highly flexible in moving goods from one corner of the world to another. Hong Kong International Airport hosts some 100 airlines operating more than 1 100 flights a day, with regular and direct services to about 220 destinations, including more than 50 in the Mainland of China. Last year, our airport managed over 70 million passengers and 4.5 million tonnes of cargo. In the first 10 months of this year, cargo was up 9.9 per cent year on year. It did not come as a surprise, as our airport has been the world's busiest for international air cargo since 1996. We have no plans to relinquish our global leadership. Instead, we seek to consolidate our position by moving ahead with a three-runway system for the airport. The project includes reclamation of some 650 hectares of land, construction of a third runway, a new concourse, and state-of-the-art people-moving and baggage-handling systems. Upon project completion, the airport will have the capacity to handle about 100 million passengers and 9 million tonnes of cargo a year. The booming growth of e-commerce has generated an ever-increasing demand for cross-border logistics and delivery services, in particular air mail and transshipment services. To cope with this growth, Hongkong Post is holding discussions with the Airport Authority and other postal authorities on the expansion of the Air Mail Centre at the airport in order to enhance its capacity and operation efficiency. DHL has just announced its plan to inject HK$3 billion to expand its Central Asia Hub in Hong Kong in partnership with the Airport Authority. The expansion will not only bolster the company's operational capacity in Asia Pacific, but also facilitate the rapidly growing international trade demands in the region and around the world. As for maritime transport, Hong Kong is home to one of the world's largest shipping communities, with 9.6 per cent of the world's merchant fleet and a dynamic maritime cluster offering wide-ranging shipping services. Indeed, later this evening, the Hong Kong Shipowners Association will be hosting its 60th anniversary celebration reception. Hong Kong Port is already one of the busiest container ports in the world, and it enables about 330 container vessel services a week to some 470 destinations worldwide. As mentioned in my Policy Address, to entrench Hong Kong's position as a diversified international maritime centre, the Hong Kong Maritime and Port Board established by the Government is actively working with the industry to formulate a comprehensive strategy to bolster and promote the development of Hong Kong's maritime industry and high value-added maritime services, and encourage overseas maritime enterprises to set up a presence in Hong Kong. 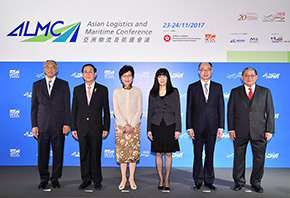 The Government is also actively implementing port enhancement measures to maintain the competitiveness of Hong Kong Port, including provision of additional terminal yard space and barge berths in phases to increase the container handling capacity of the Kwai Tsing Container Terminals and the better use of back-up land of the terminals. Despite the improvement in air and maritime transport, I would say that the most exciting developments are on the ground. When I said "exciting", this is no exaggeration, as in the next 12 to 18 months Hong Kong will commission three major pieces of cross-border infrastructure that will significantly transform our links with the Mainland and beyond, accelerating the flow of goods, people, capital and information between Hong Kong and the Mainland. In doing so, they will underscore our status as the region's business and logistical hub, boosting opportunities for Hong Kong and for the companies that partner with Hong Kong. First is the Hong Kong-Zhuhai-Macao Bridge, the world's longest combined sub-sea tunnel and bridge, which will cut journey time between Hong Kong International Airport and Zhuhai or Macao from four hours to about 45 minutes, accelerating our economic integration with the western Pearl River Delta region. Indeed, most of the Pearl River Delta's major cities will be reachable within a three-hour drive. Second is the 26-kilometre Hong Kong section of the Express Rail Link which will slash journey time between Guangzhou and Hong Kong, on a non-stop basis, to just 48 minutes. No less important, it will connect Hong Kong to our country's national rail network and its 22 000 kilometres of high-speed track. The Bay Area, which counts nine Guangdong cities, along with Macao and Hong Kong, is China's most affluent region. The signing of a co-operation framework agreement by the governments of Guangdong, Hong Kong and Macao on July 1 this year presents outsized opportunities for logistics in the Bay Area. The Bay Area will allow us to draw on the combined strengths of the participating cities and their 66 million inhabitants, bringing immense prospects to Hong Kong and our logistics sector. The twin corridors of the Belt and Road are home to more than 60 economies. Hong Kong Port has marine cargo movement with about 45 of these economies. And we have signed air services agreements or international air transit agreements with 42 of them. These established ties give Hong Kong a decided edge in meeting the increasing need for a logistics sector and services in the Belt and Road regions, particularly in emerging economies where quality logistics services are in great demand. The Bay Area development and the Belt and Road Initiative will be important drivers for Hong Kong's economic growth in the coming years. My Government is determined to capitalise on Hong Kong's traditional strengths to seize those opportunities through proactive policies, facilitating measures, timely investment and stepped-up promotions. As the logistics sector is a globalised industry, we are committed to working with you all to create more opportunities for our respective businesses and people, especially the younger generation. I am sure this two-day conference will provide further insights into how we should do it together. I wish you a fruitful discussion at the various sessions. 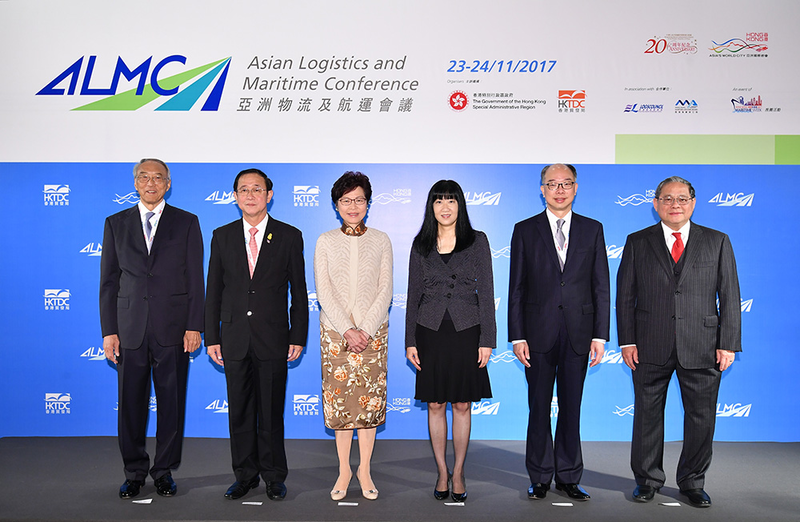 Ladies and gentlemen, Hong Kong has long been the region's pre-eminent logistics hub and an international maritime centre. With the concerted efforts of the Government and all concerned, I am confident this great sector will continue to grow, continue to reward us all. 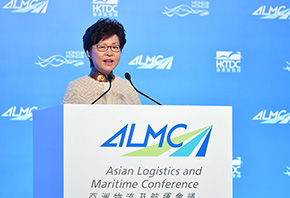 This prestigious two-day conference, which counts over 2 000 high-profile logistics professionals and government officials, is certainly showcasing Hong Kong's commitment to logistics. So is Hong Kong Maritime Week, which includes this conference, together with some 50 other events. Ladies and gentlemen, I wish you the best of business at the Conference, and a very memorable stay in Hong Kong.